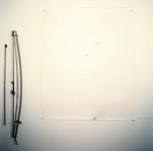 The early kinetic Drawing Machine explorations started with getting rid of my artistic and acquired classical training. The thinking was to try and see what I saw instead of trying to show what I already knew. It was also my initial segue into the world of sculpture. I remember my first impulse in making sculpture was to cut out one of my portraits and thereby make it 3-dimensional , but Alex Katz had already snagged that territory. The first of these early kinetic works was a very simple stick with a piece of charcoal attached. I’d walk forward with stick in hand and draw on paper to my right without looking and what mark was being made at that moment. Other early mark-making explorations involved drawing pendulums that eventually advanced into more complicated mechanisms. Though mechanical in nature, the works were generally rather crude, having arrived at their being via an artistic process rather than conceived from inception and then built. These early kinetic sculptures eventually evolved into the later solid cast graphite sculptures. I was unaware at the time I began making the kinetic works that there was a kinetic movement happening and even a history of such works. Quickly, I was informed of other artist such as Rebecca Horn, Vito Acconci and John Kessler. I was told about a Jean Tinguely drawing machine before my time. Thinking I was charting completely new waters, I found this all a little disconcerting at the time. I decided to continue and take the idea much further than had been done before. Then I met my neighbor, Gregg Barsamian, in Williamsburg, New York who was also doing some kinetic work. As well as teaching me the fundamentals of motorcycle mechanics, he introduced me to other artists we exhibited with like Roxy Paine and Mary Ziegler. A few years into making these kinetic works, I remember stumbling onto the work of Tim Hawkinson at Ace Gallery in NYC, who was also dong early interesting kinetic works. I was still unaware until years later that others across the continent (like Noble and Webster in England) were also doing kinetic works at the time. Making kinetic works was a natural meshing of the influence of learning how to mechanically maintain my ‘71 Harley Sportster and my interest in expanding into the world of sculpture. Nothing escaped being considered a drawing tool. I’d even turned my little Harley Sportster into a drawing machine, acquiring auto exhaust tubes and honing them in on a sheet of nice rag drawing paper (Exhausted Eyes). After several years of doing these kinetic works, which definitely unlocked some major doors in my brain, I made a graceful exit from being an artist/auto-mechanic. As my work evolved, I came up with a method for one work to cast solid graphite works. Zen, the tool and the sculpture had become one. Though a major fan of art, the only thing I was collecting at that time were great black leather jackets. I remember the financial absurdity of working on some of these machines for months and then selling them for a few thousand dollars, and then getting as a young artist only 50% of the sale. I believe I once calculated I made about five cents an hour on some of the pieces. So, I began to think of my machines as my companies and imagined them drawing all day and then only selling the drawings. Each machine made it’s own intrinsic mark, quite human that way. Though they were machines, they were more human in their nature. I began to make drawings initiated by using multiple machines. These drawings served as inspirations. Some of these drawings were so beautiful and free, I’d joke that the machines drew better than I could. Many of these and other early kinetic works (not shown) are in the personal collection of the artist. Please contact the studio for scheduling and availability.